Once you've finished all the EVA foam & fun foam construction, it's time to start coating the foam. Inspect ALL your seams/edges to make sure you've completely glued the edges together. Also, you'll need to be sure that you've glued the entire edge of all fun foam panels. If not, the PlastiDip will cause the fun foam to pull away from the base layer. 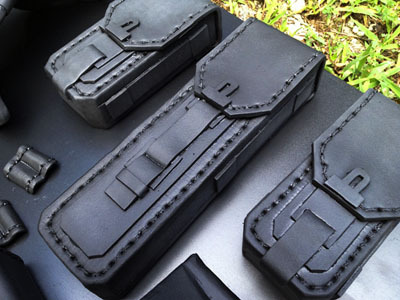 We use the Foam Coat from Matt Silva at Black Tie FX. You dab the foam coat onto the armor, don't brush it on. It will stay somewhat sticky. The only way you'll know it's ready for PlastiDip is that it gets slightly less shiny. We usually do 3-4 coats of PlastiDip. Make sure you get an even coat, especially checking the edges of the layers of foam. You'll also want to give the inside of the armor a coat of PlastiDip so that it's got a good consistent black coating where the back might be seen in photos. Sadly, I forgot to take photos of the boots with only the Plastidip applied. Here are some pics of Garron Paduk's belt pouches and pauldrons. This will at least show what the plastidipped pieces look like. 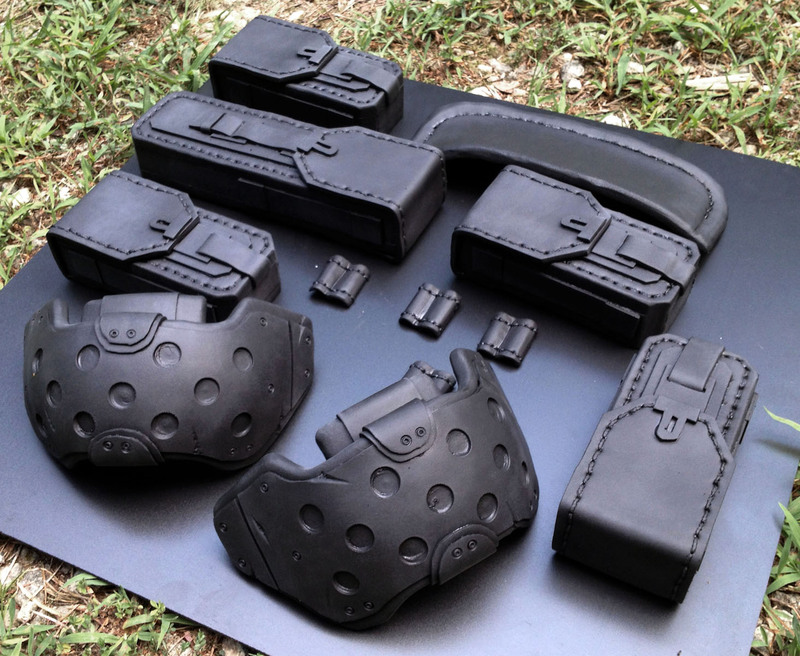 Once your PlastiDip has dried, it's time to paint! Start with about 2 coats of your base color. Depending on the quality of the paint, you may need 3-4 coats, but usually 2 will do it. Then, you can add any detail paint. (stitching, metal edges, battle damage, etc) Let your base coat dry for at least a day or so. In this photo, I'm about 1/2 way thru painting the leather backing to the kneepads. I like to paint from the top layers down. So whatever is the top layer of fun foam gets painted first. That way, as you paint the lower layers, you can clean up any spots where you got the wrong color paint on the armor. So, as I paintthe brown leather on the kneepad, I can clean up any black paint from the edge of the kneepad. And as I paint the top of the boot, I can clean up brown from the leather straps & kneepad. Yet more paint has been applied. 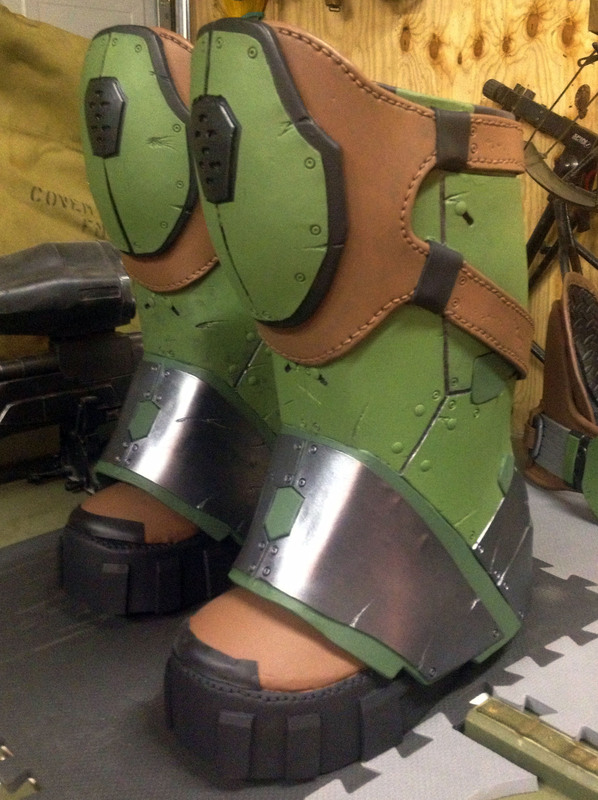 You can see that the right boot (the one in back) has only had one coat of the green applied to the boot top. Here's a close up of the kneepad. 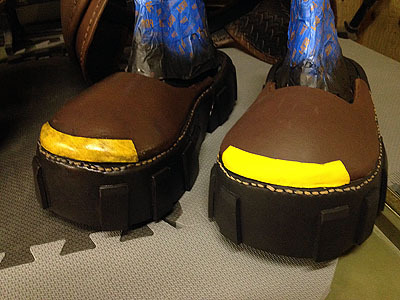 The yellow strips were applied by masking off the lines using blue painters tape. Just make sure the base coat of paint (in this case the green paint) is GOOD and dry before you put the masking tape on it. For more on applying stencils, check out my page on Painting Stencils. Harrison Krix at Volpin Props is a master of painting. Robin & I watched this video of his MANY times before painting our first piece of armor. This is a video of Harrison weathering his M8 Avenger from Mass Effect, but these techniques can be applied to many other types of props. You'll make up a slurry of paint...we mix reddish brown & black to get a good rusty/oily black. You'll paint the ALL OVER your armor. We usually do about 6"-8" square an area at a time. Now you can wipe off most of the paint using a paper towel. This will leave grunge in the battle damage, crack, crevices, and in any texture you've added to your foam. NOTE: Make sure you've let the base coat dry properly, or you'll end up wiping off the base paint as you wipe off the extra grunge. Next you'll dry brush to bring out the highlights. Just get a LITTLE bit of paint on the end of a large soft brush. You'll lightly dust this along the edges where you want to visually bring out the edge. You can do this with a lighter version of the base coat to emphasize the shape, or with chrome/aluminum to simulate wear along the edge. 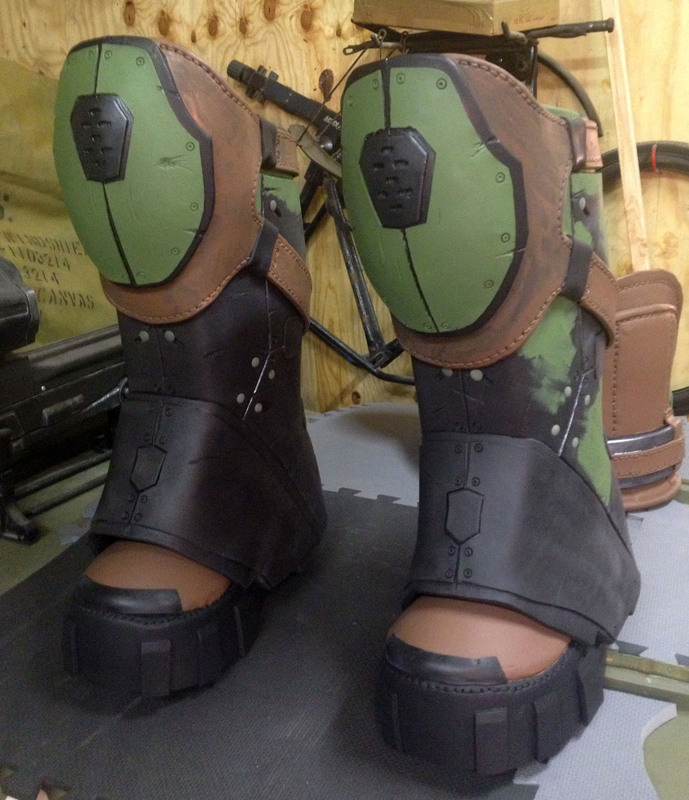 The boots are almost done! 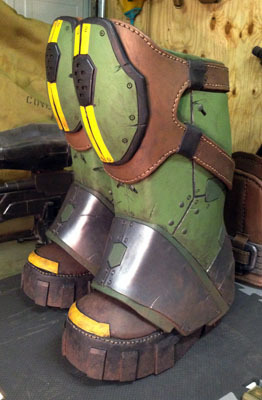 You can see that I've also added dirt to the bottom 1/4 of the boots. This was applied by dabbing brown paint onto boot by using a piece of sponge. 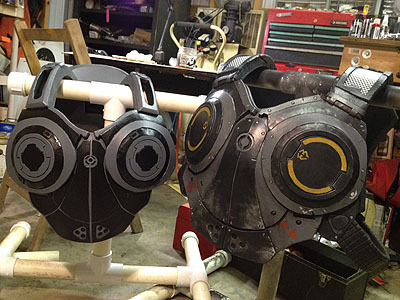 These are our Anya Stroud (on left) and Marcus Fenix (on right) chest armors. Anya Stroud's armor only has the base coats of paint applied to it. 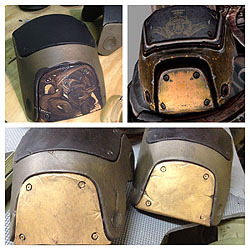 Marcus Fenix's armor has the base coats, stencils, washes, and drybrushing. Bernie Mataki's pauldron armor as it's being weathered. you can see the grunge wash being applied in the upper left photo. A screencapture of the Bernie Mataki in game model is at the upper right. The lower photo shows the first layer of grunge applied & wiped from the pauldron. 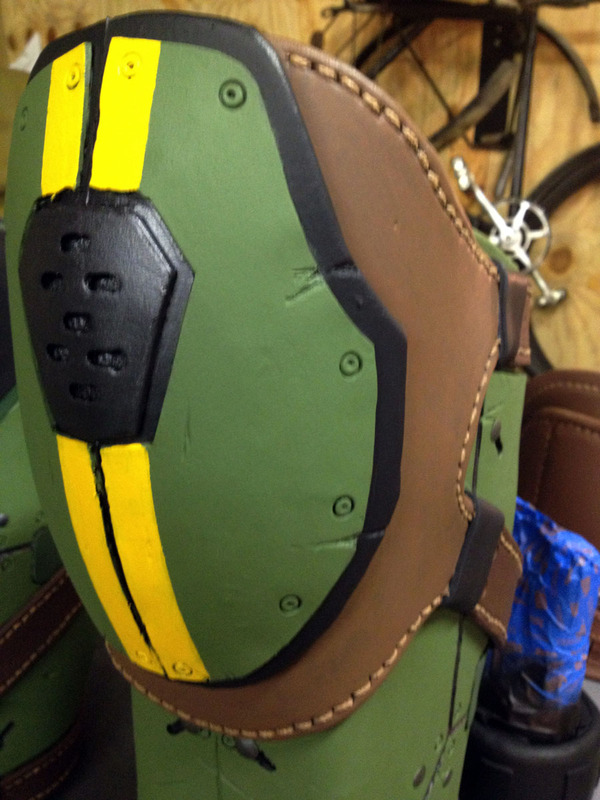 Click HERE to see the templating process for Bernie's pauldron.